Welcome. I am so happy that you stopped by. My garden gate is always open for you to come in and relax while you have a cup of tea. Do you have a favorite garden quote? One of my favorites is "Garden Angels Gather Here". 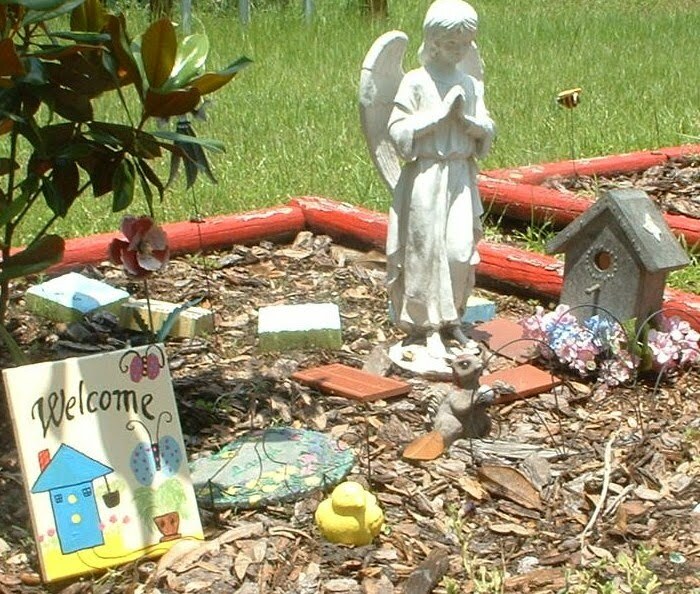 I would love to share some of my garden angles with you and then take you to a delightful a little garden in Florida where a very special "Garden Angel" lives. Bentley, my Studio Assistant. is already in the garden looking for garden angels. 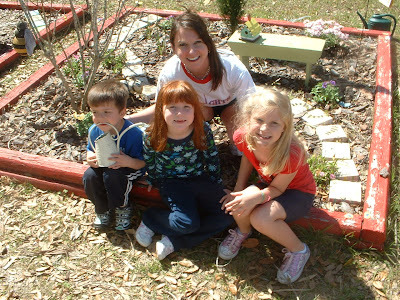 Now let's head to Florida to visit my sister, Leslie, and her adorable Grandchildren and a very special Garden Angel. 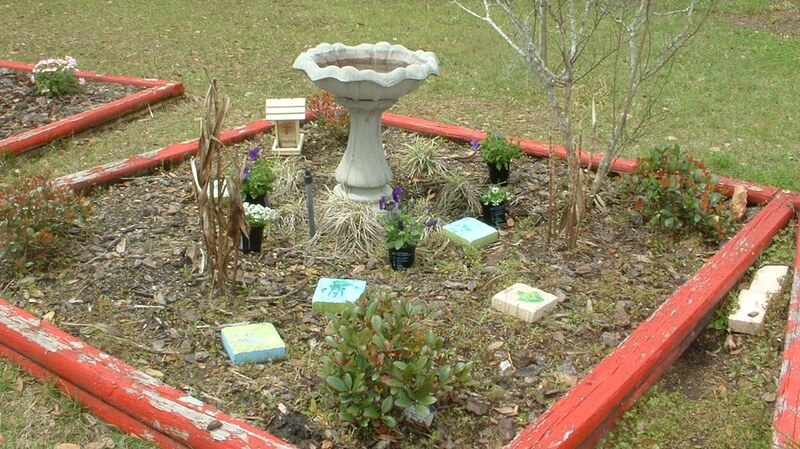 Last winter was one of the coldest winters on record in Florida and most of the plants died in four little gardens started by the young children and their teachers at a Lutheran Church and School. Leslie volunteered to bring the garden back to life. Leslie and Grandchildren and a friend sitting in front of the "Children's Garden". My niece, Jill, and two of her children and a friend in front of one of the gardens. The children had already decorated some stones with their names and footprints or names and "frogs". The children love frogs and picked frogs as the theme for their stepping stones. 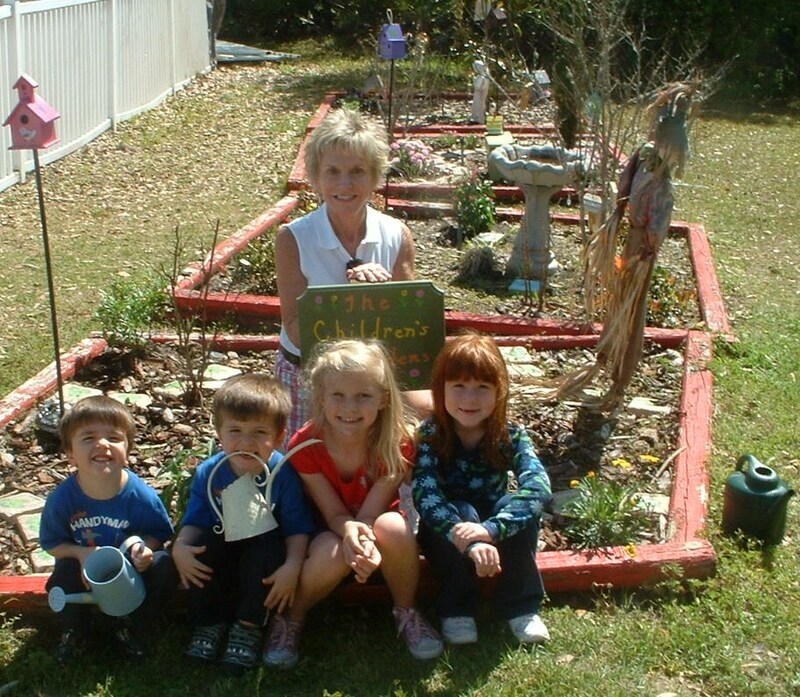 Jill is the Director of Child Development for the school and was instrumental in recruiting her Mom to bring the garden back to life after the big freeze. 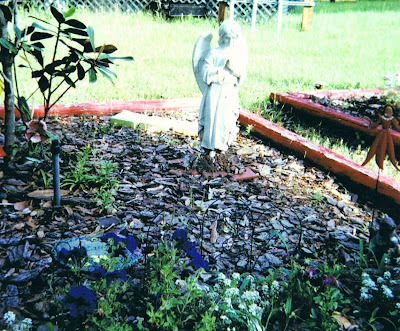 The special "Garden Angel" looking over a bare garden. Most of the flowers and plants did not make it through the freeze. Leslie got busy planting flowers and plants that would attrack birds and butterflies. 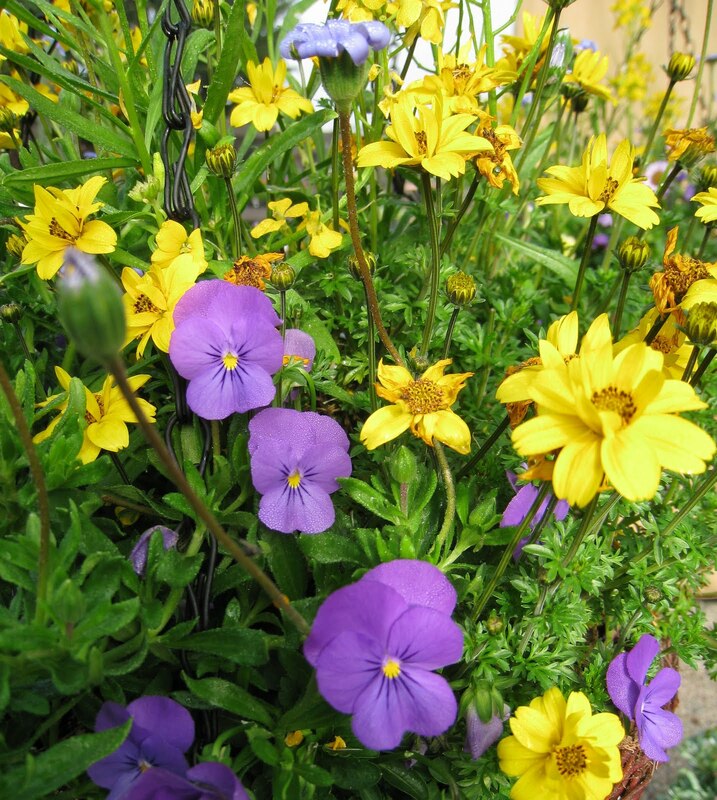 She planted petuunias, pansy, bright yellow daisy and a butterfly bush along with some annuals. Pansies and bright yellow Daises brought color to the garden. She painted bird houses . . . . . . 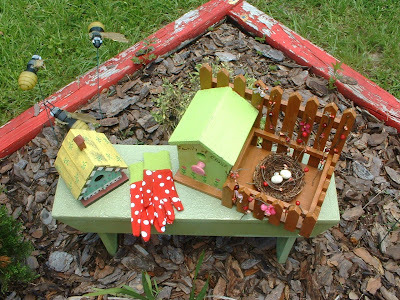 Decorated a birdhouse planter and added a bird's nest to put on a little bench in the garden. Added bumble bees and little garden gloves (just waiting for tiny hands to wear to help out in the garden) to the garden bench. 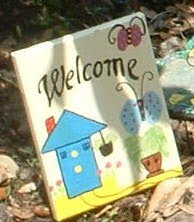 Added a whimsical welcome sign to welcome birds, lady bugs and butterflies. 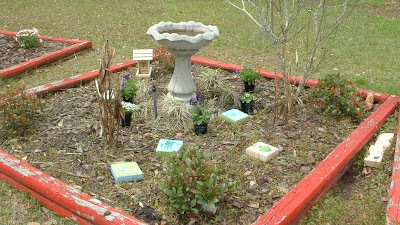 The children helped water and refill the birdbath, hang wind chimes and decorative birdhouses. 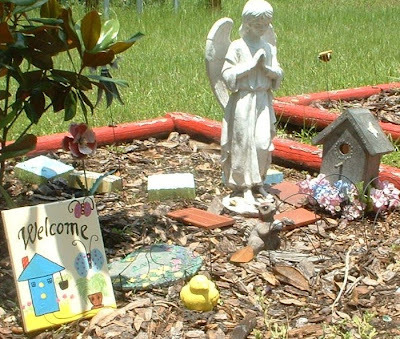 With care, the tree came back to life and now the special "Garden Angel" watches over the children and all who visit this whimsical garden . "All Things Grow With Love". Now the Children's Gardens have come back to life for everyone to enjoy. "One is nearer to God in a garden than anywhere on Earth". Thank you for stopping by. I love hearing from you and sincerely appreciate you visits, comments and those of you who are following my blog. Please let me know if you have any questions or would like to see me paint something special. This is one of the best blog posts ever. 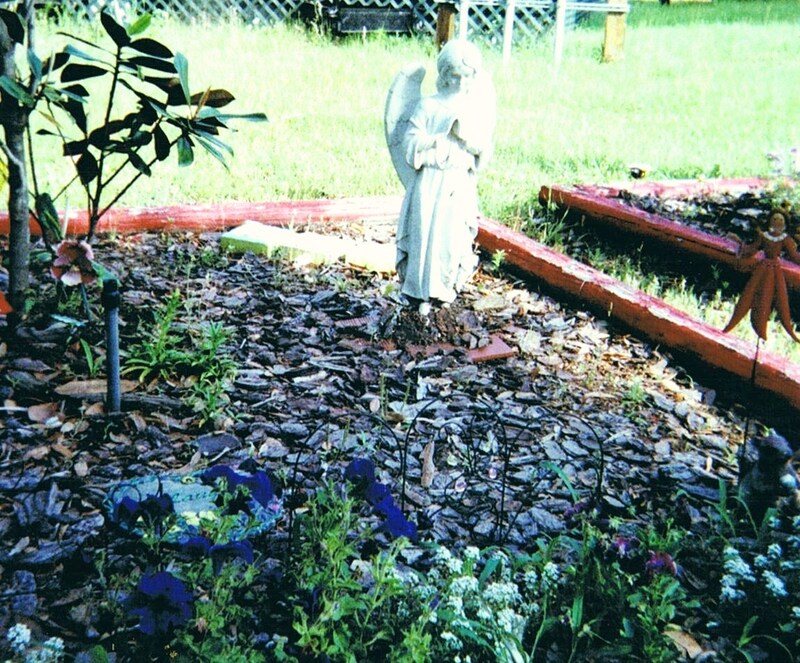 Gardening, angels, faithful Christians, and rebirth of a garden, it has it all. Thank you for sharing. 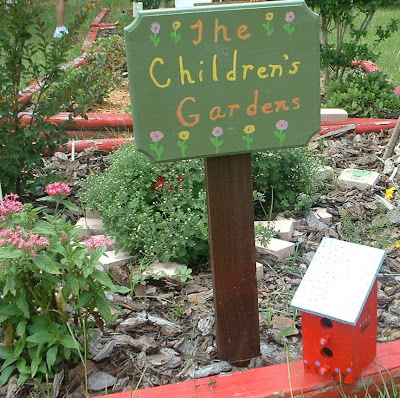 Wonderful post about the garden! I picked a huge bunch of hydrangeas this morning and thought of you and I mentioned it on my blog today. What a beautiful story, Erin. The garden is lovely. What a charming garden and the lovely story behind it's beginning!! I'm so glad that I picked up the Container Gardens magazine and read the article on you and your garden. I typed in your blog address and found a beautiful blog. Thank you so much for sharing and creating your art and garden with us - and Bentley is just too cute!